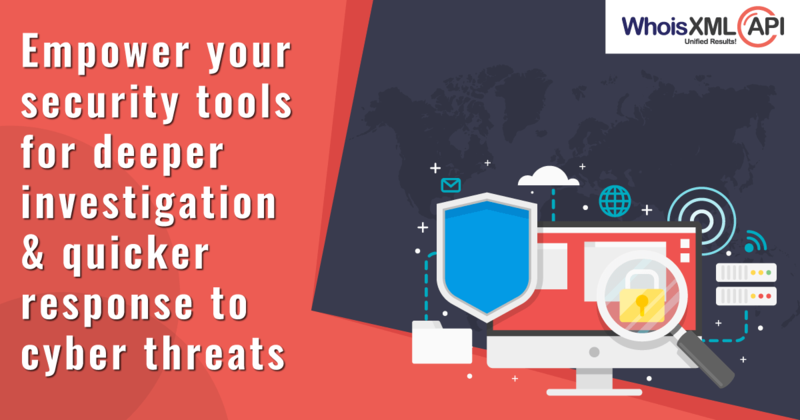 Unlock The Value & Power Of Your Security Tools With Enterprise API Package! With our solid foundation, innovations & unparalleled databases of Domain, Whois, DNS, IP, OSINT and Threat Intelligence, professionals can be sure of getting the most accurate domain data & Intel. Not only do you get all these crucial data-sets in one place, but also, have unlimited access to it! With just a single API key any number of professionals in a company can have direct access to our data. Besides that, the same key can also be used to integrate the same or different products and services offered in a package with multiple security tools of a company. So a single Package can actually solve all your data needs. Professionals no longer need to spend time finding data from multiple sources or even worry about running out of data. Depending on your data requirements you can choose from our available Tiers, at a discounted rate, which vary only in the number of queries offered for all products & services. This helps provide predictability to your business planning & solution architecture. Whois API: Get real-time key domain information including Registrant name, organization name, e-mail address, registration address, registrar information, creation date, expiration date, updated date, domain availability, domain age, and much more. With over 5 Billion Whois records covering over 2500 TLDs, we are proud to have one of the largest Whois database in the world. Bulk Whois API: With a single request, get hundreds of parsed and real-time domain Whois records in one go. There are no restrictions concerning the number of Whois records that can be included in a request. Domain Availability API: Get the most accurate & real-time information about the status of a domain & know if it is registered by someone or not. Reverse IP/DNS API: Get a list of all the domains, including gTLD, new TLD & ccTLD, that share the same Internet host (i.e. the same IP). It is the quickest way to know all the possible domain names hosted on a particular IP address. Our database currently consists of over 1 Billion IP addresses which are updated on a daily basis. Reverse MX API: Get a list of all the domains, including gTLD, new TLD & ccTLD, that share the same Mail Servers. It is the quickest way to know all the possible domain names hosted on a Mail Server. Our database currently consists of over 140 Million MX records which are updated on a daily basis. Reverse NS API: Get a list of all the domains, including gTLD, new TLD & ccTLD, that share the same Name Server. It is the quickest way to know all the possible domain names hosted on a Name Server. Our database currently consists of over 190 Million NS records which are updated on a daily basis. Reverse Whois API: Looking for domain records but don’t have much information to go on with? Using one or more unique identifiers such as a person or company’s name, phone number, email address or any other Registration details found in a Whois record, you can find all the domain names associated with that term. Brand Alert API: Proactively monitor brand name & trademarks and get timely alerts if those specific terms show up across all the recently registered and newly expired domain names. Registrant Alert API: Stay informed about the domain activities of an organization or an individual easily by proactively tracking their Whois record information. Get timely alerts to know when your monitored registrant makes any changes in their domain’s Whois records or even if they register new domains & drop old domains. Whois History API: Get all the historical Whois records for any domain since the first time it was registered and every subsequent change in its ownership thereon. Also, any update made in the Whois record for the domain, be it a change in the domain’s Ownership, Name Server, Registrar, Contact Details or any other alteration made in the Registration data will be shown in the results. With over 10 years of data crawling our database consists of over 5 Billion Historical Whois records. IP Geolocation API: Get 100% accurate physical address information including County, State, City, Postal code, Latitude & longitude, Timezone for IP addresses across the world in real-time! Our database covers approximately 99.5% of all the existing IP addresses covered. IP Netblocks API: Find out which IP range a particular IP belongs to, along with its subnetwork name, the organization responsible, last update, abuse, admin & tech contacts, and country code for the range. Our database contains details of over 8.7 million IP Netblocks from all the existing 5 Regional Internet Registry (RIRs). Our database currently consists of over 8.9 Million IP Netblocks which is updated on a daily basis. DNS Lookup API: Get detailed DNS server insights for a domain by accessing over 50 types of DNS Resource Records, right from IP address to Name Server or Mail Server information and more! Email Verification API: Verify existence, validity, and quality of email address in real-time. Our system checks for Syntax, Typos and Curse Words, Disposable Email Address, Mail Server Existence, Mailbox Existence, Catch-all Email Address to provide a holistic picture of any Id. Domain Reputation API: An advanced website security analysis tool, which determines a domain’s risk level by taking into account over 120 parameters before predicting the Reputation Score & confirming if a domain is safe & legit! Our detection system analyses a Domain’s Infrastructure along with its Malware Threat Level as per reputed external sources and assigns a composite safety score ranging from 0 (dangerous) to 100 (safe). With such an extensive portfolio of domain Intel products & services, professionals can analyze numerous data-sets to get insights, which can be a great building block for threat detection & investigation. Enterprise API Packages can strengthen existing security offerings and open new & highly profitable revenue streams for; small consulting organizations with strong intelligence backgrounds and subject matter expertise, leading Value-Added-Resellers (VARs), System Integrators, Managed Security Service Providers (MSSP), Managed Detection and Response Services (MDR), Threat Intelligence Companies, Antimalware & Fraud Solution Companies, etc. They can improve the performance & scalability of their Security Information and Event Management (SIEM), Threat Intelligence Platform (TIP), Information Security Operations Center (SOC), Incident Response Platforms, Automation, and Orchestration Tools by automating domain & network data collection & processing.